Invokana (canagliflozin) is an oral diabetes medication belonging to a class of widely-used drugs called sodium-glucose cotransporter-2 (SGLT2) inhibitors, which are commonly prescribed in combination with diet and exercise as a treatment for Type 2 diabetes. Invokana was approved by the U.S. Food and Drug Administration (FDA) in 2013, and is currently manufactured by Johnson & Johnson’s Janssen Pharmaceuticals subsidiary. In individuals with Type 2 diabetes, the body is unable to properly use insulin to process sugar, and the pancreas is no longer able to keep up with the demand for insulin, which allows the amount of glucose in the bloodstream to reach dangerous levels. Invokana and other SGLT2 inhibitor drugs are designed to lower blood glucose levels by inhibiting a special protein in the kidneys, which prevents glucose from being reabsorbed into the blood and allows it to leave the body during urination instead. Despite the fact that Invokana is a relatively new medication, the Type 2 diabetes drug, along with other drugs in its class, has already been linked to a potential risk of serious side effects in users. One of the most dangerous complications allegedly linked to Invokana therapy is diabetic ketoacidosis, a serious medical condition that can cause fatal swelling of the brain, severe dehydration, coma and possibly even death. 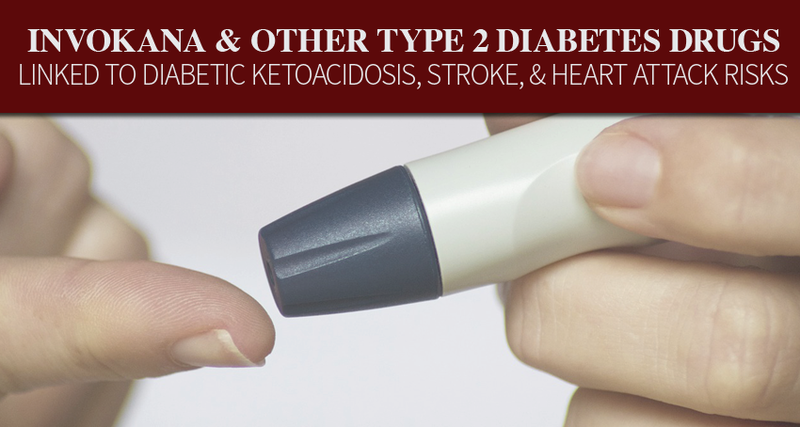 Diabetic ketoacidosis (DKA) occurs when the body is no longer able to use sugar as a fuel source, either because there is too little or no insulin available. Instead, the body begins to break down fat for energy, which produces blood acids called ketones. When ketones are allowed to build up in the bloodstream, they can become toxic and cause serious medical complications. Another potentially life-threatening side effect possibly linked to Invokana is kidney failure, believed to be connected to the action of the Type 2 diabetes drug on the kidneys in the removal of glucose via urination. Product liability lawsuits brought against Janssen Pharmaceuticals by patients who used Invokana in the past allege that the drug maker knew or should have known about the potential risk of Invokana diabetic ketoacidosis and kidney failure problems based on the way the diabetes medication is designed to function. However, consumer complaints allege that Janssen Pharmaceuticals and Johnson & Johnson failed to provide adequate warnings to the public about the risk of severe adverse events allegedly associated with the prescription diabetes drug. In May 2015, the FDA issued a drug safety communication warning about the potential link between SGTL2 inhibitors like Invokana and an increased risk of ketoacidosis, “a serious condition where the body produces high levels of blood acids called ketones that may require hospitalization.” At that time, the FDA had identified 20 cases of ketoacidosis side effects in patients taking SGLT2 inhibitor medications from March 2013 to June 6, 2014, all of which involved hospitalization to treat the medical condition. In December 2015, the FDA updated its Invokana ketoacidosis warning, and also reported on the possible connection between treatment with SGLT2 inhibitors and serious urinary tract infections possibly leading to hospitalization and kidney failure. 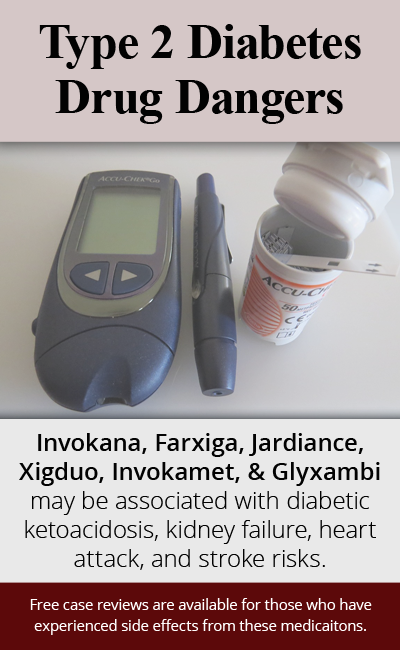 The Institute for Safe Medication Practices (ISMP) also weighed in on possible Invokana side effects in 2015, warning that the diabetes drug was linked to a higher-than-anticipated number of reported complications, surpassing 92% of the other medications regularly monitored by the agency. As more and more Type 2 diabetes patients are switched to Invokana therapy, the number of adverse events reported in connection with the SGLT2 inhibitor continues to climb. If you believe you have been adversely affected by alleged Invokana side effects, consult the knowledgeable product liability team at Monroe Law Group today for legal help. With a qualified Invokana attorney on your side, you can protect your legal rights and seek fair and timely reimbursement for your injuries and medical bills.